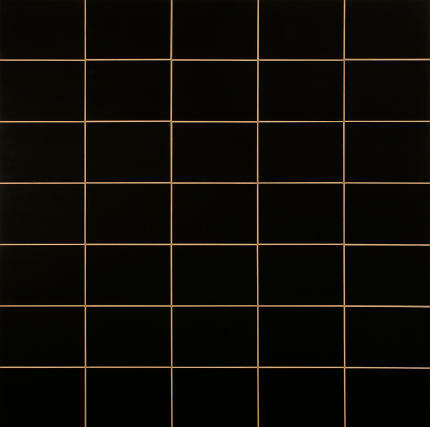 This work of art (I’m in a charitable mood) is called “Schwarze Tafeln”, which basically means “black panels”. And this object really is what it says on the box. There are five of these, they look absolutely identical and they’re simply cardboard squares stuck onto big metal frames. And I hate them. They symbolize all that is wrong with modern art. We saw these things when we went to the Frankfurt museum of art, the Städel, the other day. They’re the work of a Frankfurt-based artist named Peter Roehr and they’re exhibited in a bright and shiny and simply humongous new wing of the Städel that deals with “Gegenwartskunst” (Art of the Present). And the sad thing, the really depressing thing, is that these weren’t even the worst things on display, but merely the ones that I can rant about the easiest. The artist, who died in 1968, apparently said that this work is supposed to express the meaninglessness of modern art, but seriously, if you say that about your work you’re just not trying hard enough. You also don’t do another 599 pieces that express exactly the same. To be fair, if he had said that this piece symbolized child starvation in Uganda, I wouldn’t have bought it either. I can’t quite fathom the mind of an artist like Peter Roehr. He died young. I shall refrain from any jokes, because he died of cancer, a fate that no one deserves. And yet, at the relatively tender age of 24, he managed to produce more than 600 works of art. Had a writer produced even one tenth of that in a full life with 40 good working years, many would call him a hack. Now, that may or may not be true, but what does it say about Peter, and his 600+ works? We seem to accept this number, even if accomplished in such a short time, much more readily when it comes to paintings. Yet no one ever seems to consider the assembly-line-esque conditions under which these works must have been created. Did Peter Roehr, or any of his ilk, really put any heart or effort into those works? Some say that anything is art, but I disagree. I like my art to be pretty; that’s a subjective statement, but on a more objective level I also like my art to mean something. Not “mean” as in “this painting is about child starvation in Uganda”, but as in something that took thought or effort or skill. My viewpoint isn’t easily quantifiable. It is obviously silly to say that something that took ten minutes to make isn’t art, but something that took 10 minutes and one second is. But still. Peter Roehr was active as an artist from 1962 until his death in 1968. That makes, if one assumes a steady output of 600 works total, one object every 3 days. That’s an awful lot, I’d say. And as we’ve discussed above “it symbolises ze futility of art” doesn’t really cut it for me. So what makes you tick, Peter? Greed? Maybe. I’m not sure. Some people need to have creative output, I get that. I don’t suspect my musings on the subject will get me anywhere, at least not anytime soon. If there’s an afterlife I’ll pop the question to Peter in a few decades or so. I hope he has a satisfying answer. Until then I remain vaguely puzzled at the mystery of Peter Roehr and why people seem to think his “Schwarze Tafeln” are the bee’s knees. Slight change of subject: I’ve been thinking a lot about art lately, mostly because I’ve been wondering about ways to sell my own art. Am I too modest or too arrogant? How much is too much when it comes to the price? Peter was too arrogant, I’d say, but the opposite isn’t great either. I loved making the Compendium entries, and they helped us out of a terrible fix monetarily, but we sold them barely above what it cost us to produce them. What is the artistic value of these drawings outside of this highly specialized context? I have always felt (unlike my friend Peter, I assume) that it is hugely important to give value for money. The thought of overpricing my works is horrifying to me. The thought of somehow grossly overestimating their artistic worth even more so. No-one likes pretentiousness, least of all me. I erratically oscillate between self-doubt and confidence. To make it worse, I don’t only have to think about my own skill, but also about what other people will consider art. Judging from what we saw in the Städel… a whole lot, and not much of it looks like what I do. Sigh. Another question with no easy answers. What I was going to say, before I got hit by seven tons of self-doubt, is that I’ll also have a lovely, more general, article about modern art for you tomorrow. So be sure to check back! I’ve always been drawn to the Warhol quote, “Art is what you can get away with.” One subtlety of the context isn’t that some rich fool will buy even the most plastic of plastic art, but that it’s over-moneyed fools on -both- sides of the debate, for who else would debate the merits of spending obscene cash on one decoration over another but those with obscene cash? Is the claim to ownership of any painting really worth more than, say, ten separate lavish houses, or however else one can describe the opportunity cost of the staggering classical price tags? The act of monetizing art is in some ways alien to the act of enjoying art, and more often (through history) represented an elimination of enjoyment as a piece joins a private collection (the act of enjoying the possessing of art, one can easily suppose, is at least a partial response). The current age of free and perfect reproduction at least frees the piece to be enjoyed by more than one purchaser, but the monetary value of a piece is always simply -what others are willing to pay-, independent of and indifferent to you, and other people have vastly different ideas about value, worth, pleasure, art, all the rest. A commitment of the same $number can be sacrificial for some and trivial for others, and at a certain level of capital the idea of the opportunity cost really begins to break down (What can Bill Gates no longer buy if he buys a coffee, really?). And thus I can sympathize that it seems emotionally an act of both hubris and vulnerability to attach $number to your art, knowing (for example) that some will be offended by the sacrifice you are suggesting they make for you while others will laugh at the utter worthlessness such a low $number indicates your art to have. But an economist will say that $number is always arbitrary, and some fraction of people will always fall on the “yes” side of that number while others will fall on the “no” side, and are you happy with the “yes” people you’re getting? The relationship of a price to buyers is very akin to the relationship of a polarizing filter to photons, in certain ways. And while the quantity of “yes” people is important for making sure you can afford to live, certainly, you can also ask yourself if the -quality- of “yes” people is what you want it to be. If your work is a party with a cover charge, are you liking the guests in your living room now? There is satisfaction in throwing an awesome party for awesome and grateful guests, and managing the cover charge accordingly. If you must judge, try judging yourself by this instead of by $number, and from this charge what you ought to to keep the party rocking as long and as awesomely as possible, for all these awesome people you now know. Again, sorry, this is mostly my old philosophy background nipping venomously at me tonight, but I hope it’s helpful to mull about!